Russia-led forces mounted seven attacks on Ukrainian positions in Donbas, eastern Ukraine, from 00:00 to 18:00 on Monday, April 15, using banned 120mm mortars in three instances, the press center of Ukraine's Joint Forces Operation (JFO) has said. "Russia-led armed formations also opened fire on our units' positions, using grenade launchers of various systems, large-caliber machine guns and small arms," the JFO's press center said in an evening update on Facebook on Monday. "No Ukrainian army casualties have been reported. The Joint Forces fired back. Information about enemy losses is being verified." All attacks were recorded in the Skhid (East) sector. Enemy used 82mm and 120mm mortars to attack Ukrainian troops near the town of Avdiyivka, 120mm mortars were used near the village of Novoselivka Druha in two attacks. 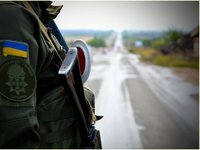 Terrorists opened fire from anti-tank grenade launchers and small arms near Avdiyivka, grenade launchers were used near the village of Opytne, and large-caliber machine guns near the villages of Nevelske and Lebedynske.